Capture of the Pirate, Blackbeard, 1718 depicting the battle between Blackbeard the Pirate and Lieutenant Maynard in Ocracoke Bay by Jean Leon Gerome Ferris, 1820. Yo ho ho and a bottle of rum! Pirates: at once the most fascinating and elusive subjects in maritime history. Criminals’ stories from any time period are difficult to piece together, but sea rovers even more so. This section looks at the myths and realities of piracy on the high seas. Much ink has been spilled on tales of pirates, only to be taken over by the silver screen. Books like Peter Pan and Treasure Island inspire children’s imaginations, while films like Captain Blood and Pirates of the Caribbean reinvigorated tall ship sailing and Halloween costume sales. 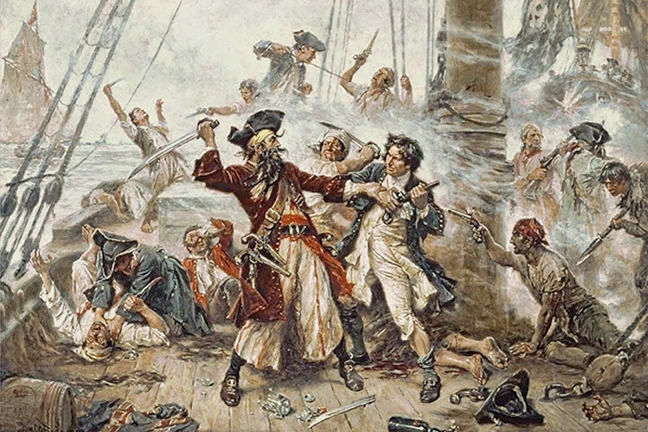 How real are these popular depictions of pirates? Much of what we currently consider true about pirates comes from 17th-19th century books, but these were highly romanticised accounts written for an eager public. Charles Johnson’s (possibly a pseudonym for Daniel Defoe) A General History of the Pyrates is often used as a history, but it was produced as a popular book and written with great creative license. It is from fiction writer Robert Louis Stevenson that we get much of the pirate stereotypes like peg legs and the Devonshire accent. Unfortunately, these sources can hardly be trusted to be accurate though they claim to tell the tales of real people and ships. Real pirates were viewed by society far differently from what we consider; they were comparable to serial killers or terrorists today and society rewarded them with the same punishment: the death penalty. In fact, pirates were mercenaries, religious minorities, sailors discarded by the navy, and second sons without any prospects at home. In short, a rigid society without upward mobility or enough jobs created a surplus of misfits and outcasts, while large-scale and vulnerable maritime commerce created opportunity. However, pirates were not necessarily the equal or egalitarian groups often depicted in books, since authors were often Jacobites or other minorities using pirate stories to argue against status quo. To get the real story of piracy, it is necessary to investigate further through archaeology. We know piracy is as old as sailing itself. The public today is used to the stories of Age of Sail buccaneers, but the earliest historical texts from maritime cultures are sprinkled with accounts of sea rovers capturing ships. Ancient cultures have been attacked for millennia, from the Mediterranean Sea to the Indian Ocean. One of Rome’s great accomplishments was to rid the Mediterranean of pirates, a feat that earned Pompey (Julius Caesar’s friend and later competitor for dictatorship) the moniker “the Great.” A sea without pirates - or warring factions - led to a golden age of maritime commerce known as Pax Romana or the Roman Peace, illustrating the impact pirates could have on trade. Despite pirates’ prevalence throughout time, it was not so long ago that archaeologists wondered whether we would ever locate a pirate lair or shipwreck. How could we tell a pirate site from a normal site? Fortunately, today we know of dozens of pirate sites and a method for identifying them has been developed. In fact, so many people are now working on pirates that it is its own subfield, though there is still much to be found! How can we distinguish the remains of a pirate ship from a regular ship? After all, black flags, eye patches, and peg legs don’t survive well in the archaeological record. To begin, pirate archaeology is most commonly practised by historical archaeologists. These archaeologists use historical documents - as opposed to archaeologists that study cultures without writing - to find mention of a location where a ship sunk or descriptions of a pirate lair in the area. Once you have evidence of a general location, you go looking for potential sites. Imagine you find a shipwreck; what sort of artefacts would tell you that this is pirate ship rather than a merchant or navy ship? Consider how a pirate’s life differed from that of a regular sailor. Stanley South, one of the fathers of historical archaeology, came up with a handy method for determining differences between archaeological sites. He separated artefacts by functional category to figure out a culture’s primary behaviours. Pirate archaeologists have adopted this method and found that pirates have far more weapons than a usual ship and the weapons are of variable quality and manufacture. Also, these sites have more international goods. Why is this? Because their weapons and goods are stolen instead of being supplied by a navy or merchant company! So which archaeological sites have been identified? 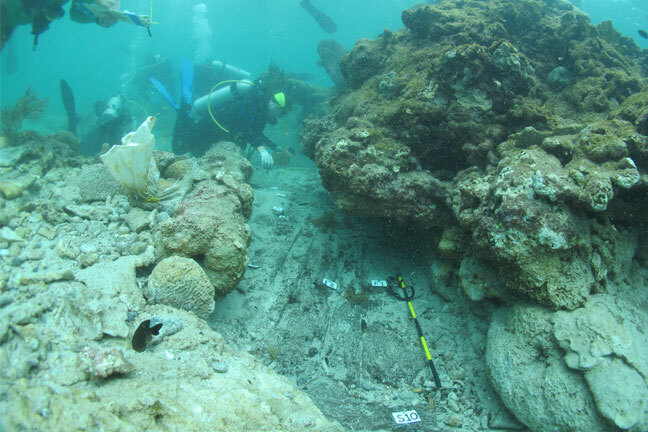 The Beaufort Inlet Shipwreck in North Carolina has been the focus of many years of excavation and the results suggest it is likely the Queen Anne’s Revenge, flagship of the pirate Blackbeard. One of the most infamous pirates was Captain Kidd, who sailed with English permission to attack enemy vessels. However, when he finally captured a prize it was claimed that it was not an enemy vessel at all, making Kidd not a legal privateer but a pirate. Kidd was declared a pirate and summoned to court. Kidd took the prize’s French passes to prove his innocence, but they were misplaced by his business partner and Kidd was hung for piracy. While away at court his ship, the Quedagh Merchant, caught fire and sank in shallow water off the Dominican Republic, only to be found recently by maritime archaeologists at Indiana University. 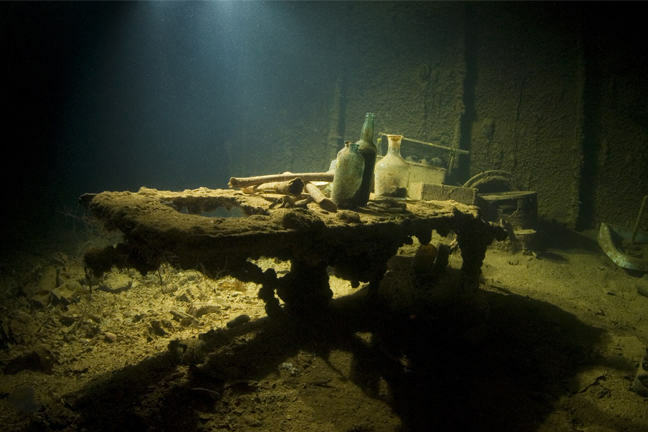 Recently the shipwrecks of the most famous buccaneer of all, Captain Henry Morgan, were found in Panama. Morgan lost the five ships in bad weather while attacking forts on the Spanish Main. Think pirates only plied the seas? River pirates were notorious and deadly. As trade shifted from the Atlantic Ocean to the interior of North America, so too did piracy. The rivers of North America were open season by all kinds of criminals who eagerly attacked passing flatboats and steamboats. Pirate lairs have been found throughout the Ohio and Mississippi Rivers. River pirates had many different cons; some would open false taverns to draw ships close and murder the crew while they drank, others would wait for ships to dock at night and drill holes in their hulls so they sank, and more than a few posed as local pilots who claimed they could navigate hazards but crashed the ships into shore where their armed friends were waiting to attack. What about buried treasure? Bad news: there is not much evidence that pirates buried treasure, other than a popular account of Captain Kidd hiding his treasure before reporting to court in New York. 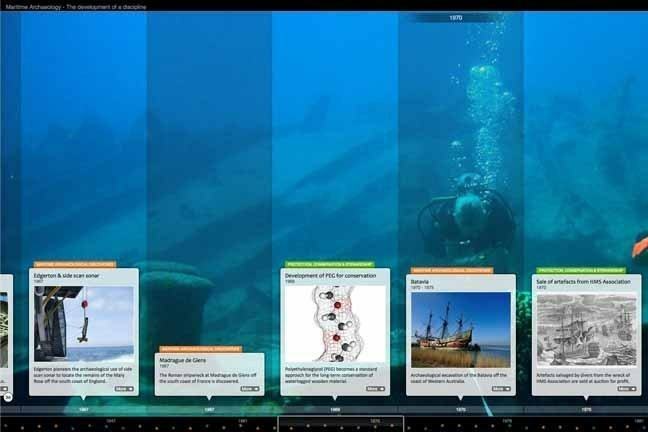 While there may not be treasure in the form of gold and silver, shipwrecks are buried treasure for archaeologists interested in how pirates lived and died, how they travelled, and what shipboard communities were like during these periods in time. Dead men do tell tales, if you know how to read the evidence!